American Oak often means Tennessee white oak, but other oak from the US makes its way abroad where winemakers are less familiar with the geography of North America. The “other” American oaks may not have the open grain and vanilla flavors that are the halmark of Tennesse white oak. French Oak primarily come from the forests of Alier, Tronçais, Vosges, Limousin or Nevers. The reason that the French oaks have famous names is that they are from very special forests. The tight grain and water tightness required to make good wine barrels has another, once critical, and now nearly forget use. It is used to make ships. The Limousin and Nevers forests were planted by the French Admiralty for the express purpose of building navy vessels. It is one of life’s happy coincidences that the decline of wooden boats occured at about the same time that the modern wine industry in France was on the rise. French oak is denser, but less water tight, with less gallic and vanillic acids. The latter, vanillic acid is what gives oaky wines that vanilla taste. For the organic chemists in the crowd, vanillic acid is a benzoic acid, and vanillin is a benzaldehyde. 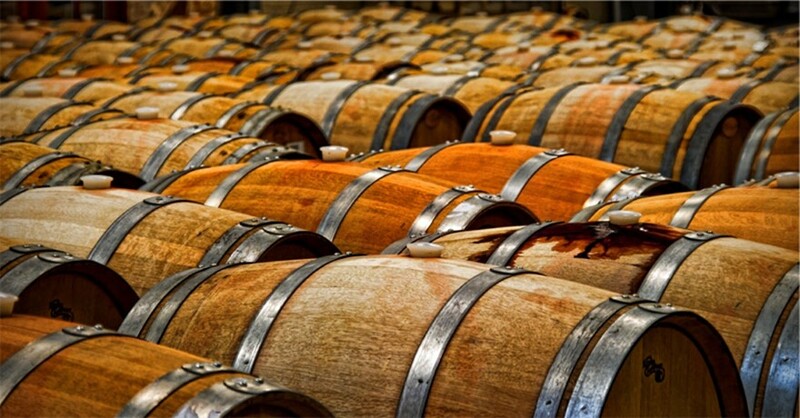 Gallic acid gives the wine an astringent character, both of these acids are more present in American oak. Because the wood is not naturally water tight, it is necessary to split it along the grain and then air dry it for 2 or 3 years. French oak is subtle and flavorful, American oak is rich and intense. While the choice of oak is somewhat subjective, it is clear that some grapes are better suited for one variety or another (but that is another discussion). Slavic oak is another, and less pricey oak. It is popular in Italy and eastern Europe. Oak is not the only wood used for wine. Redwood for example, was very popular until quite recently, in California. Woods other than oak are almost always chosen for their neutral qualities. Recent advances in computer control have made their mark on the world of oak barrels. Very specific toasting routines can now be obtained. This results in more precise flavors being imparted to the wine. Another trend in oak is to do away with the barrel completely. Oak chips, staves or other pieces of the wood can now be added to the wine directly. This allows the flavors to be imparted in a short period of time, but does not allow for the development of aromas which is the other reason for barrel aging. Developing aromas can also be accomplished via technology, using a technique called micro-oxygenation. Oak alternatives are usually only used in value priced and bulk wine production. How close are we to Dionysos?